When we lived in Taiwan, my kids loved eating Taiwanese ‘pudding’. This is basically like a creme caramel that came to Taiwan circuitously via Japan. Any self-respecting, decent bakery or patisserie (and there were a lot to choose from) had a gourmet version of this pudding. 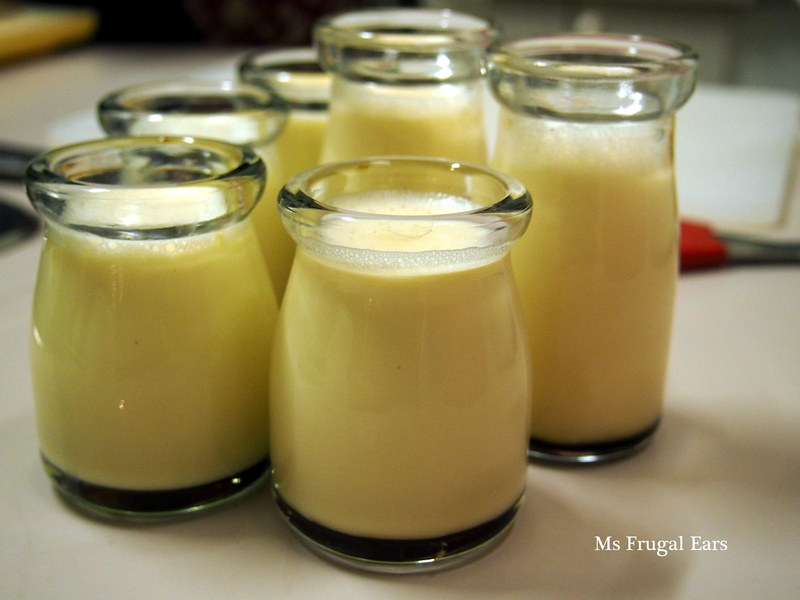 It is a simple recipe, but it took me a while to discover how to make it. I previously blogged on my Taiwanxifu site about a version made with gelatine, which resembled the 7-Eleven/Convenience store type they were used to. But now I have recreated an upmarket, steamed version. I even made it in the special glass pudding jars they use in Taiwan. I made these for my kids, and I also made them as part of a group cooking class run by Cooking Circles. Cooking Circles is an initiative of Heidi Zajac. Heidi spent time in Timor Leste working on a project to help improve the nutrition of East Timorese women. Many young women were moving from the countryside to the city in search of jobs. They didn’t want to eat traditional, peasant foods (nor did they always know how to cook them). Instead they wanted the processed and imported foods they saw foreign aid workers eating. Heidi developed a system of community-based cooking groups to help these young women learn how to cook, encourage them to use local ingredients and also to make friends. She has now extended this program to Canberra, and I was excited a few weeks back to participate in one on Taiwanese food. The challenge for me in cooking and talking about Taiwanese dishes was to define what Taiwanese cuisine actually is. The food that is eaten in Taiwan is an amalgam of many different influences. As a foreigner, I could impartially observe what and how people ate, and it was not always what Taiwanese thought of as ‘Taiwanese’ food. 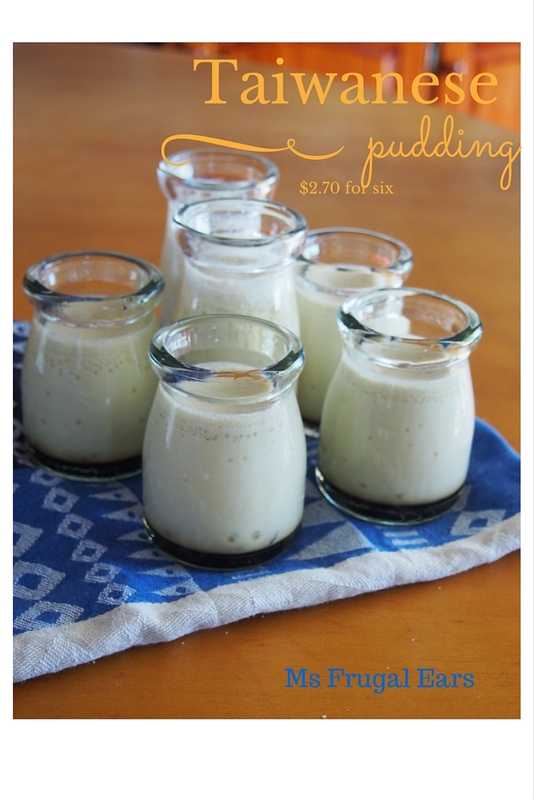 This pudding recipe is an example: every Taiwanese child grows up eating this, yet you would be unlikely to ever find it in a Taiwanese cookbook. My children are certainly familiar with it, and they are so excited when I make pudding. Try it and you will see why. Make the caramel by dissolving the sugar in water and boiling in a small saucepan. There is an art to getting the caramel right; not so much that it turns, but enough that it becomes lock-jaw toffee. The timing will vary depending on the size of the saucepan and the heat at which you cook it. Spoon a little onto a dish to test it is done. And be careful not to leave it unattended as it can burn quickly. 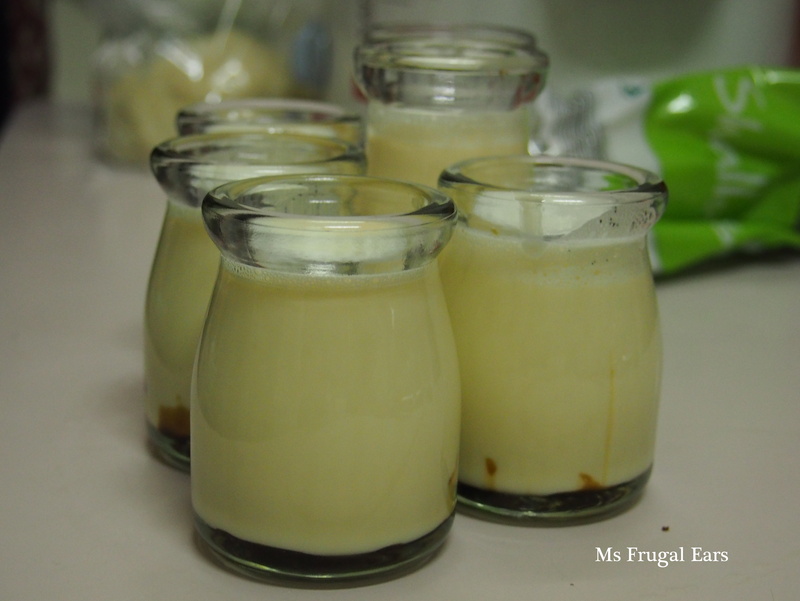 While still hot, spoon the caramel into the base of six Taiwanese pudding bottles, heat-proof glasses or ramekins. Allow to cool slightly. Meanwhile, make the custard. Heat the milk, cream and vanilla in a saucepan until it it almost boiling. In a separate bowl, beat the eggs and sugar with a whisk until the volume increases. When the milk is hot enough, slowly add a few tablespoons into the egg and sugar mixture and and beat vigorously until combined. Gradually add the remaining milk. Pour the beaten egg and dairy mixture through a fine sieve into a clean bowl (or ideally a jug). 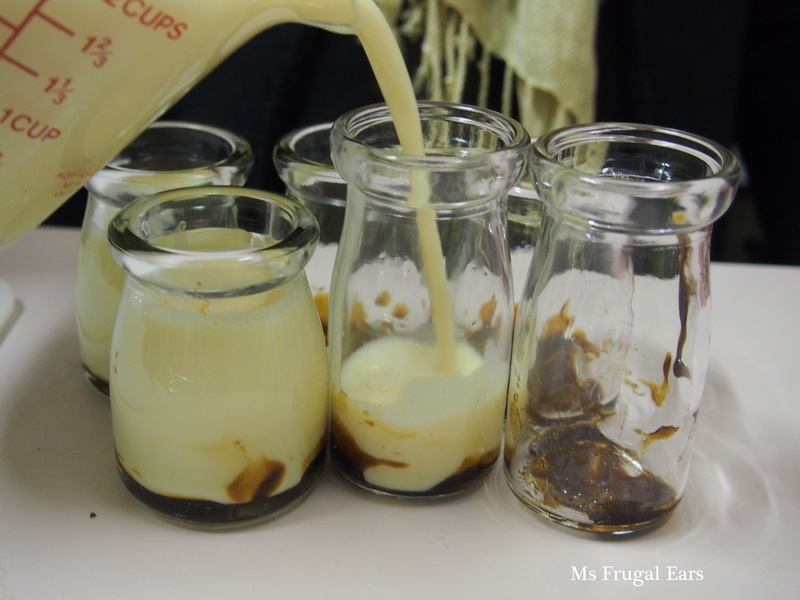 Allow the mixture to cool slightly, then gently pour the egg mixture over the caramel. 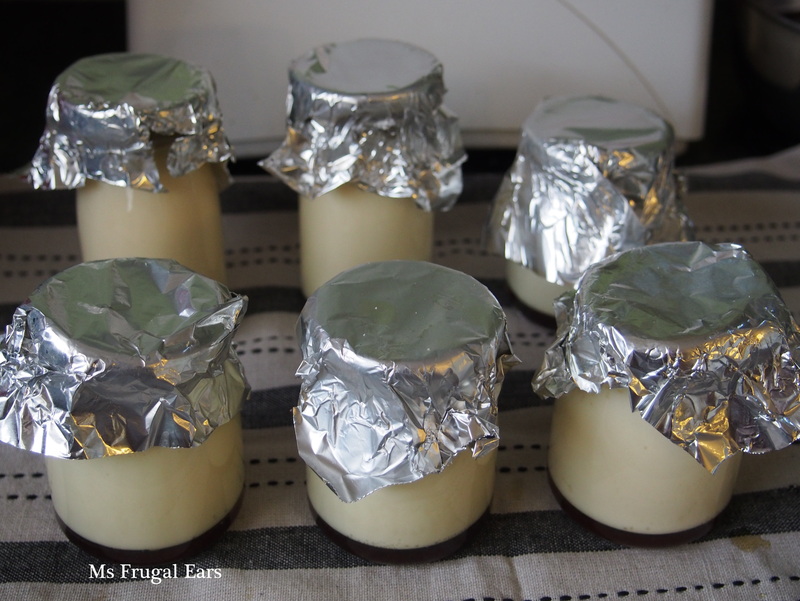 Cover the pudding bottles or ramekins with aluminium foil. 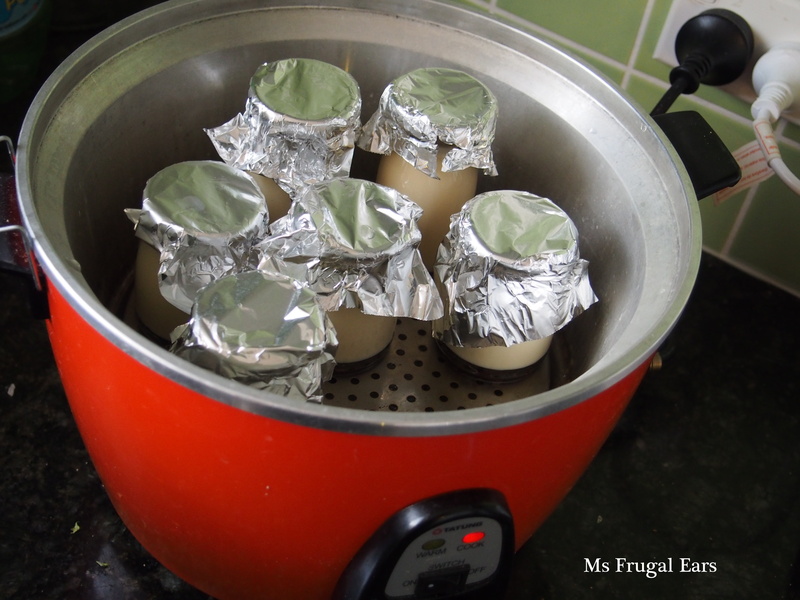 I steamed my Taiwanese pudding custards in a unique Taiwanese contraption – a Ta tung multi-functional cooker. I added one cup of water to the outer perimeter of the electric cooker, and put a chopstick in between the lid and the cooker to allow a little of the steam to flow through – this allows the puddings to cook at a lower temperature and avoid as many air bubbles. If you do not have a Taiwanese electric cooker, you can put the puddings on a trivet in the bottom of a large saucepan. Add some water to the bottom, place the saucepan lid on slightly askew, and then boil for around 15 to 20 minutes. Alternatively, place in a large baking tin and cover halfway up with water. Bake in a medium oven for around 20 minutes. 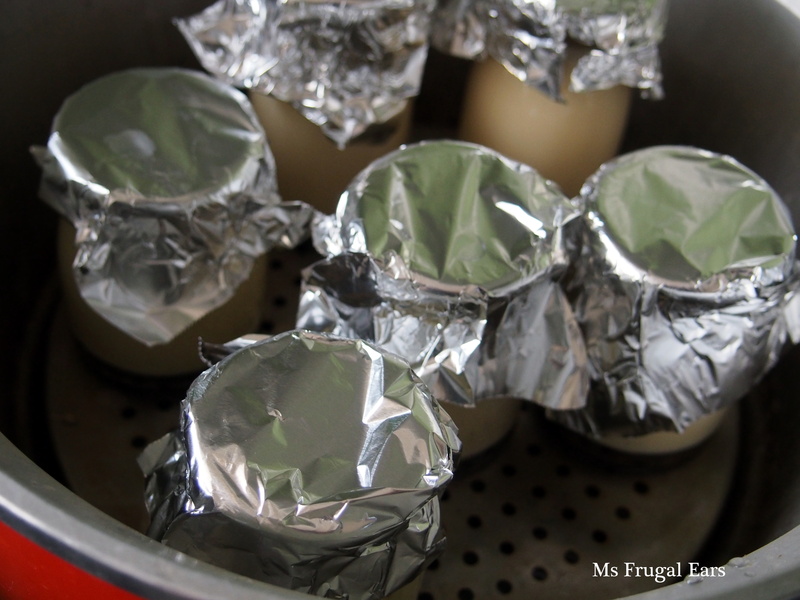 Could you use a rice cooker instead to steam the puddings? I havent tried this – i think it would work. Is it time operated?